It’s a nightmare scenario for every event planner: You order something crucial to the event’s success, only to realize later that you’ve scheduled it for the wrong date. That’s exactly what happened to Andrea Sundermann, who plans events for the 5,500-member Michigan Dental Association (MDA) as the organization’s continuing education director. “It was the last minute, several years ago, when I realized I had booked the wrong dates for the Indian Trails’ shuttle buses we were going to need for our annual convention,” she recalls. Knowing that our buses are typically booked for months out—and in a controlled panic—Sundermann phoned to see what we could do. 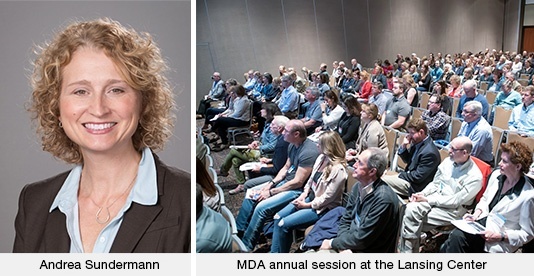 Besides its Annual Session, the MDA organizes three scientific and 15 one-day sessions each year to keep its member dentists up-to-date on their clinical and practice management skills. The events also enable dentists to earn continuing education credits toward the 60 they must have every three years for license renewal. Since 2002, Lansing has been included in the three-year rotation of sites for the MDA Annual Session. The other locations are Grand Rapids and Detroit. “Initially, we didn’t know if Lansing could accommodate all the members that come to our session,” says Sundermann, adding that the ability to shuttle members between the Lansing Center downtown and outlying hotels was a big factor in adding the Capital City to the rotation. With the help of the Greater Lansing Convention & Visitors Bureau staff, Sundermann turned to Indian Trails after her experience with a different transportation company failed to meet her expectations. The annual session included three hours of concurrent sessions each morning and afternoon, with many options to gain continuing education credits, as well as clinical and practice management updates. A trade show with some 200 exhibits was also part of the convention. The MDA used six of our motorcoaches to shuttle attendees, including dentists, dental assistants and hygienists, from their hotels to the Lansing Center, and then to other off-site locations for evening entertainment. 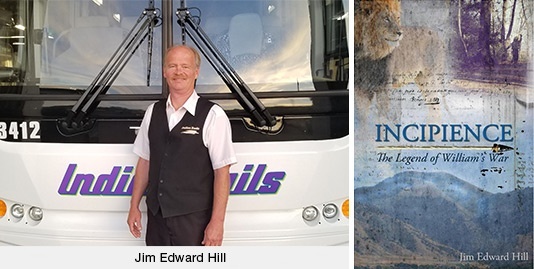 The passengers who board Jim Hill’s regular Indian Trails’ route to and from Chicago might be surprised to learn that their driver is also an author. In fact, we were delighted for Jim at the news this spring that his debut novel—“Incipience: The Legend of William’s War”—was recently published by Summit Street Publishing and is available on Amazon. The Christian-based novel, geared toward 10-14 year olds, is about a teenage boy who’s meant to fulfill a prophecy and the trials and tribulations he encounters along the way. Jim actually wrote this novel more than a decade ago and set it aside. He hauled it out again after joining a writers’ workshop in Owosso, Mich., where he lives. There he met writer Elizabeth Wehman, who started the workshop. She inspired him to take another look at his first effort and work to revise and improve it. “She’s one of my biggest cheerleaders,” said Jim, adding that it took him about five months to rework his original manuscript. In her online review of Jim’s work, Wehman called it “a must read,” comparing his story to those by author C.S. Lewis. Jim, who’s been writing for 25 years, is a graduate of The Institute of Children’s Literature. He’s written six plays and a screenplay, as well as poetry and song lyrics. He’s also appeared in more than a dozen plays. The newly-published author, who expects to turn his first novel into a trilogy, can’t remember a time when his imagination wasn’t working overtime, visualizing new characters and their worlds, then fleshing out the details by writing them down in longhand. He deliberately reins that imagination in, however, when he’s behind the wheel of one of our motorcoaches. Then it’s all about the safety of his passengers and constantly scanning the roadway. Before hiring in at Indian Trails, Jim had owned and operated a rural motor route delivering The Flint Journal. Having a regular working schedule is also a plus for Jim. That way, he knows exactly when his free time is coming up, when he can grab his notebook and pen, and unleash his imagination once again. Can Public Transportation Save the World from Climate Change? That striking and serious question was explored in depth last September by METRO magazine, a trade publication covering public transit systems and the motorcoach industry. It stems from the fact that cities and states worldwide—along with their public transportation systems—play a critical role in achieving the voluntary reductions in greenhouse gases called for in the landmark Paris Climate Agreement. 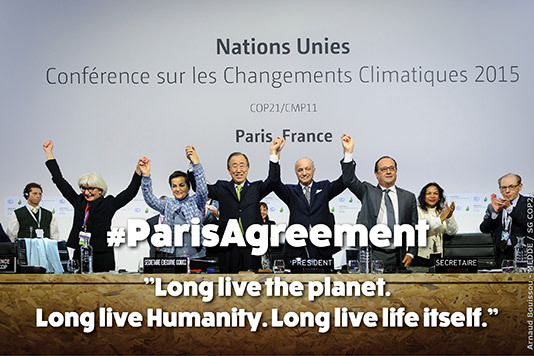 The agreement was signed in December 2015 by 197 countries, including the United States. While 178 countries have since ratified the Paris Agreement, in June 2017 President Donald Trump announced his plan to withdraw the U.S. from it as purportedly wasteful and bad for business. However, according to the terms of the agreement, the earliest possible effective withdrawal date for the U.S. is Nov. 4, 2020. Why is a bus company telling you this? Because conservation is part of our DNA. 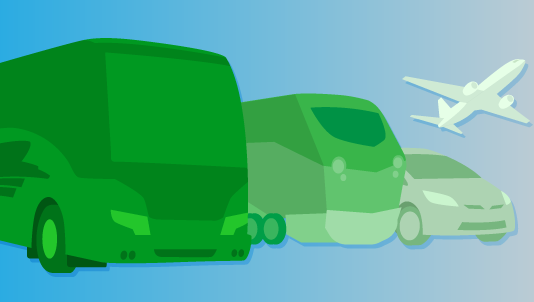 The Union of Concerned Scientists confirms that motorcoaches like ours—with near zero emissions—are the greenest motorized travel option of all, compared with planes, trains and automobiles. A study for the American Bus Foundation provides granular detail comparing fuel use and CO2 emissions by transportation mode. According to recent Gallup surveys, most Americans see environmental protection as a high priority, even if it hampers economic growth. About three-quarters support a bigger investment of government funds in solar and wind power, as well as tighter industrial pollution standards. As METRO magazine pointed out, at least 125 cities, 12 states, 183 colleges and universities, and 900 businesses have committed to meeting the target greenhouse gas reductions of the Paris Agreement on their own. So have some 369 mayors representing 67.5 million Americans, including the 10 largest cities in the U.S.
That’s not surprising. Based on average global temperatures, 2017 was the third warmest year ever recorded, behind 2016 and 2015. Greenland’s coastal ice caps have reportedly “melted past the point of no return.” Glacier National Park, which had about 150 glaciers when it was created in 1910, is down to less than 30. 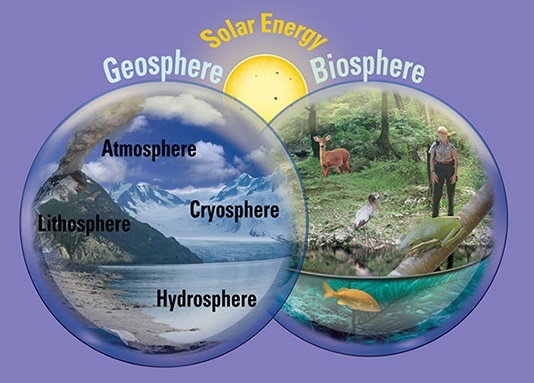 The shrinking Artic ice cap is being blamed for extreme weather events worldwide. Climate change is thought to be the main culprit behind slowing a key Atlantic Ocean current to a 1,000-year low, the continuing drought and monstrous wild fires in California, as well as two Category 4 hurricanes (Harvey and Irma) hitting the continental U.S. during the same year for the first time ever, followed by Maria, which devastated Puerto Rico. The public transportation industry has long been moving to vehicles that emit near-zero greenhouse gas pollution. That’s already true of all motorcoaches in the Indian Trails fleet, as well as the buses of many municipal transit authorities and commuter train lines nationwide. Now more than ever before, states and cities across the U.S. are looking to public transportation as an essential, eco-friendly option to passenger cars and trucks. They’re incentivizing ridership by providing employee passes and expanding transit budgets. They’re converting city bus fleets to electricity and bio fuels. They’re starting to use smartphone, GPS, mapping apps, and other technology to make it easier and cheaper for people to leave their cars behind. Public transportation alone may not save the world, but it’s clearly playing an enormous part in preventing climate catastrophes. Consider the fact that just one of our intercity motorcoaches—filled with passengers who decide not to drive themselves—can take 55 cars off America’s congested roadways. Now multiply that by the nearly 900,000 motorcoaches in operation across the U.S. today, and you get the idea. On July 4, 1776, America’s original 13 colonies adopted the Declaration of Independence drafted by Thomas Jefferson. 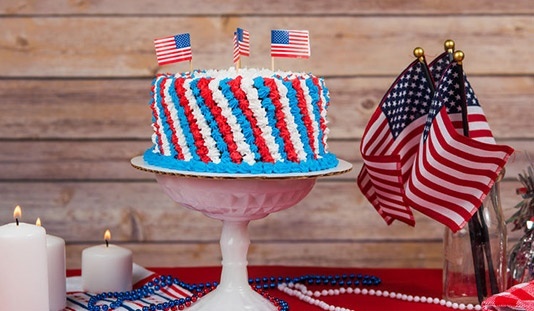 Ever since, this day has been celebrated with fireworks, parades, picnics and concerts as the birth of our free nation.